More than seven years after the first generation A5 Sportback imposed itself in this segment, the new A5 will arrive to Audi Athlone early next year. The second generation comes with a re-engineered suspension, promised enhanced performance, and what Audi describes as innovative driver assistance systems. The new model has a more athletic design helped by a slightly stretched wheelbase, and short overhangs, and the wider, flatter single-frame grille. The wave-pattern shoulder line and more pronounced curves over the wheel arches work well. The Audi A5 Sportback has grown inside, in length by 17mm, the shoulder room for driver and front passenger by up to 11mm, and the rear knee room by 24mm. It also offers 480 litres of luggage capacity. The new model features a new suspension and Audi claims that the new electromechanical power steering delivers enhanced road feedback and steering precision. 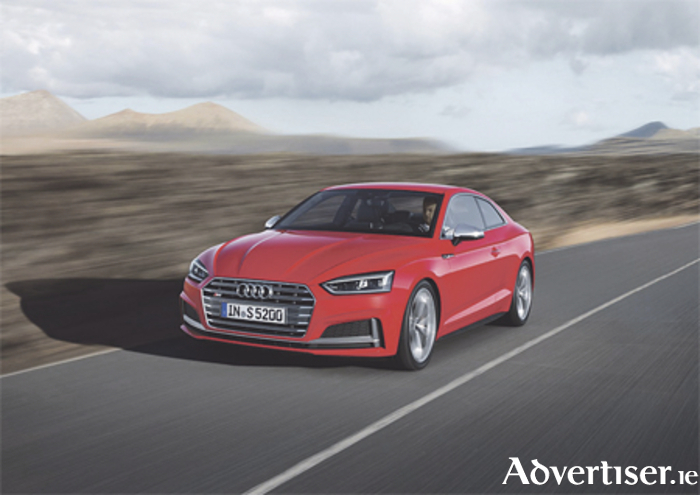 Audi is offering a choice between two TFSI and three TDI engine versions for the new Audi A5 Sportback. These engines produce between 190bhp and 286bhp of power. Compared with the previous model, Audi claims that it has reduced its fuel consumption by as much as 22 per cent while increasing power output by up to 17 per cent. The top-end S5 featuring quattro and eight-speed tiptronic as standard, accelerates the model from 0 to 100km/h in 4.7 seconds, and up to an electronically governed top speed of 250 km/h. Six-speed manual transmission, seven-speed S tronic dual-clutch transmission, or the aforementioned eight-speed tiptronic are available. Audi says that the body of the new A5 Sportback is the lightest in its segment - 15 kg lighter than that of the predecessor, with the overall weight around 85 kg less. The driver assistance system’s adaptive cruise control (ACC ) stop and go system includes traffic jam assist. It assists drivers in slow-moving traffic up to a driving speed of 65km/h by assuming the tasks of braking and accelerating the car. The German carmaker claims that the predictive efficiency assistant, which evaluates GPS information from the car’s immediate surroundings, helps to save fuel by giving specific driving advice, which it claims is a unique feature in this segment. Audi says that collision avoidance assist intervenes if the car needs to drive around an obstacle to avoid an accident. Based on data from the front camera, ACC, and radar sensors it computes a recommended driving line within a fraction of a second. The line-up is complemented by other assistance systems such as turn assist, park assist, cross traffic assist rear, exit warning, camera-based traffic sign recognition, Audi active lane assist, and Audi side assist. Join the team at Audi Athlone for the ‘Future Now Test Drive’ event on October 15 and 16 to test drive the full 171 range. The all new A5 Coupe is a static model and will be available to test drive in January, 2017. Contact (090 ) 6403000 for more details.